Gelan Gura reservoir construction with community. April 20, 2012, Gelan Gura, Ethiopia–Jam-packed day today with Tessema Bekele and his team at EDA – Emmanuel Development Association. We travelled south of Addis and got to sample some of the local traffic congestion on the highway to the eastern port in Dijbouti. Seemed like every truck and his mini-bus brother was out there. On the way to the EDA offices, our Country Representative, Gebriel, briefed us on Ethiopian history, culture, government, foods, crops and so much more. That man is a font of wisdom and interesting facts – and he sure makes a drive in congested traffic pass quickly. Tessema is the founder and Executive Director of EDA, and he started the organization in 1996 with the aim to improve the socio-economic situation of vulnerable children, youth and women through integrated, community based, and sustainable development programs. EDA is impressive in both its reach to the most vulnerable communities and the disciplined approach they take to make lasting change happen. Tessema and his amazing team put together a full day visiting a variety of projects, but I have to focus this blog on one that really stands out. 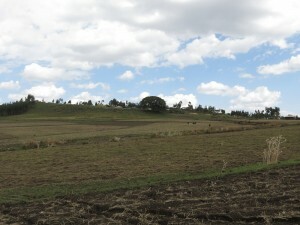 The Gelan Gura community - home to about 4,000 people in the rural area outside Addis. The Gelan Gura Kebele (i.e., community) is a community to the east of Addis, and while it is currently quite rural and quite poor, you can see the city’s development heading its way with the building of new industrial sites on the road from Addis. 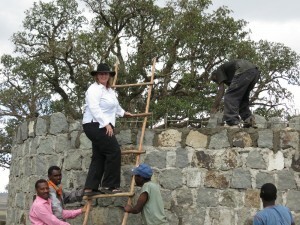 CFTC is supporting the building of a water system for which the community had requested support from EDA. They had been suffering from waterborne diseases for a long time, and had to walk a distance to get water from the local spring or river – both of which carried unhygienic and polluted materials. EDA worked with the Community Water Committee to scope the project to meet their needs, and EDA took the initiative to bring a professional engineer on board to ensure it was done to high standards. This water distribution system is being set up to serve more than 4,000 people in the current communities, with the potential to reach 10,000 in time with future expansion of the system. It may look unimpressive, but the Gelan Gura borehole and water distribution system will mean health and life for up to 10,000 people. So what does a water distribution system look like? Basically, a capped bore hole that reaches 40 metres underground to the water table is dug in the middle of a field. 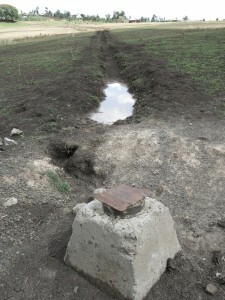 From this hole, trenches have been dug and pipes laid to bring the water all the way to the closest village on a nearby hilltop where a large stone reservoir is being built to store the water. From this reservoir, trenches have been dug and pipes laid to the three other communities, including one at a considerable distance away across many fields. Each community will have its own local reservoir and water tap – and those days of long walks with the jerry cans and donkeys to the river and back for poor quality water are almost over. 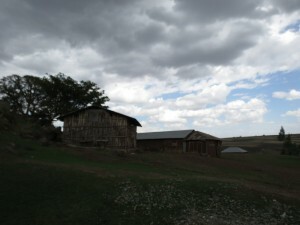 Clouds gather over Gelan Gura school. What I love about the work of EDA is their willingness to do things right – not just to build a well but to build a well-designed and integrated system that not only meets the community’s immediate needs now but can be expanded in the future. As EDA Program Manager Yonas Ashgari said, “Water is life,” and the support EDA has provided to the Community Water Committee to organize themselves and oversee management of the system is inspiring as they strive for better quality of life through better quality of water. Once again I am deeply impressed by the practical and sustainable ideas of our local partners – and there are many great lessons learned we can share with our other country projects.